The dove is not an entirely obvious choice as the perfect symbol of Peace, but it’s held that status among many nationalities for a mighty long time. Me, I found it highly annoying to think that such a tiny-brained creature was elected as representative of the state so revered and desired by so many. Peace, I thought, shouldn’t be personified by a little avian of fairly grubby habits with, arguably, one of the more proportionally miniscule skulls in the company of birds. But on second thought, it’s quite a good fit, and kind of encouraging on top of it. If peace is to be even the slightest possibility for humans, then it had better be achievable by the truly, wildly less-than-perfect. That’s one way in which the vast majority of humanity is not only well equipped but generally overqualified: we’re guaranteed to be flawed. So to think we might have even a tiny shot at meeting, finding or bringing peace is heartening. Like the dove, we bipeds are a bunch of weaklings; even among those with actual muscle, it’s rare to find folk with strength of character and will and wisdom to match, so it’s up to the rest of us much more ordinary louts and fools to get the job done. What do you say? Shall we not tumble out of the nest and give it a try? 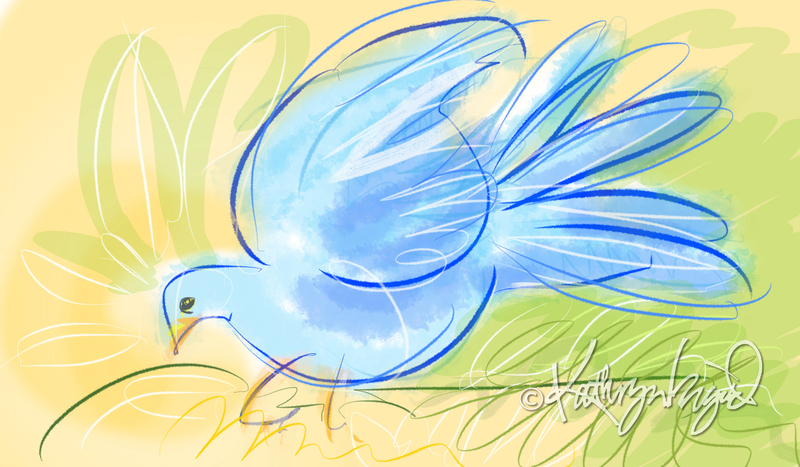 This entry was posted in Art, community, Design, Happiness, History, Human Nature, Humor, Nature, Peace, Thinking Aloud and tagged art, community, digital illustration, dove, Dove sei [where are you]?, Drawing, flawed, happiness, hope, human nature, humor, imperfect, love, mascot, Peace, weaklings, will, wisdom by kathryningrid. Bookmark the permalink. Seeing Kiev, I think we should make every effort Kathryn.. I love how you thought through the paradox and came up with a brilliant answer to the dove’s questionable status as a mascot for peace! We definitely all need to do our bit, even if it is just smiling at somebody or getting involved with a cause. Given half the chance I would want the entire world to hear me echo the words of Mother Teresa – “Be Pro Peace, Not Anti War”. The simple fact of focusing on the positive and not the negative will heal the world. Have a beautiful happy love filled weekend dear Kath. We are so worried about what can be done for us, we forget what we should do for others. That always helps peace out a bit. 🙂 I love the image Mandy! Do you just draw these each day? They’re incredible. Peace seems to be a word much used but never achieved! I love your original approach! I wish I knew you – but anyway, reading your blog is a pleasure.